Every writer has been admonished to show not tell. But how do we do that? Instead of telling the reader your character is uneasy, consider the body language. You might use a physical description such as shaking one’s head, crossing and uncrossing the arms or legs, shifting in one’s chair, or slipping hands into pockets. You might also give an internal sensation such as your character experiencing a slight chill or shiver, the hair lifting on her neck, or a quiver in the stomach. Just remember, in order to create a strong reader reaction to the emotion, you must also show what triggers the feeling. 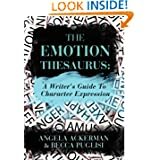 All of these cues were taken from The Emotion Thesaurus: A Writer’s Guide to Character Expression, by Angela Ackerman and Becca Puglisi. I purchased an electronic copy from Kindle for less than $5.00. Next time you struggle to show not tell, try The Emotion Thesaurus. I think you are really going to love this writer’s tool. P.S. My sister, Candace Simar, and I will be teaching a class titled “Using Photographs to Inspire Life Stories” at the Brainerd Center on Wednesday, May 8th. If interested, please contact me for more information. More info on Wednesday, May 8th please. Hi Vicki – I’ll be making another post next Monday! Anything special you would like to learn?